"Inspired by daily life, art history and religious traditions such as Zen Buddhism and Quaker Christianity, my paintings and drawings explore contemplative spiritual experience. My work begins with the basic design and construction materials of gouache and wood. Through the economical use of line, color, texture and the illusion of light and space, I create a visual dialogue between painted surface and wooden substrate. The resonance of this interaction is at once expansively mysterious and intimately familiar, an experience often associated with moments of contemplative insight. Due to my content aspirations, this work belongs within the American tradition of small- scale non-representational abstraction, with artists like Georgia O’Keeffe, Agnes Martin and Richard Tuttle as some of its precedents. Corey Drieth was born and raised in Northern Colorado. He attended Colorado State University in Fort Collins where he received undergraduate degrees in Philosophy/Comparative Religious Studies and Studio Art. 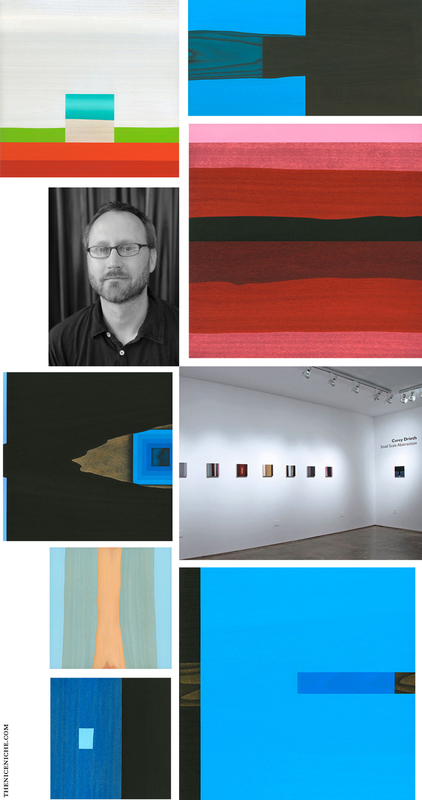 After serving as the Critic and Artist Residency Series (CAARS) coordinator for CSU’s Hatton Gallery, he attended graduate school at the University of North Carolina and received an MFA with a thesis in drawing/painting in 2004. Before joining the Visual and Performing Arts Department at the University of Colorado in Colorado Springs in August 2007, Drieth taught studio art classes at CSU, the University of North Carolina and the University of Virginia. His work has been exhibited throughout the country, including San Francisco, Chicago, Albuquerque, New Orleans, Washington DC and New York City.